We sell a range of wild bird feeders, including specialist feeders for Sunflower Hearts and Suet Pellets that have been specifically designed to minimise any unnecessary wastage, while attracting as many wild bird species as possible to your garden. All our wild bird feeders are easy to maintain, easy to fill, hang & use! Please ensure that you hang your wild bird feeders away from locations where predators may be able to hide. If you want to attract a wide variety of birds to your garden, it is important to offer a good selection of wild bird food, but it is not necessary to spend lots of money on specialist seed mixes that you may not need! If you have not feed the wild birds that visit your garden before, we would suggest you start with Sunflower Hearts, Peanuts and Suet Pellets that can dispensed using wild bird feeders, on bird tables or on the ground, in a variety of places in your garden, including a few peaceful areas for timid wild birds. 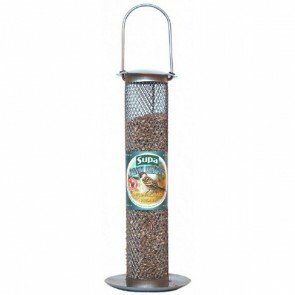 Specialist Wild Bird Feeders: 5 stars out of 5 based on 0 user reviews.